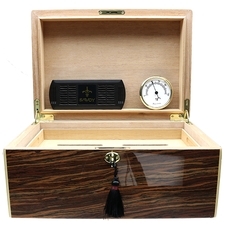 Featuring built-in locks, Savoy's large-size humidors offer plenty of room for the the more thorough cigar aficionado, including a two-level interior with removable upper tray. 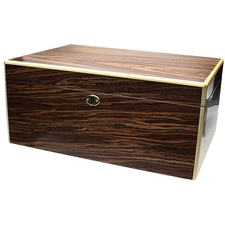 Construction is of solid, tightly-joined cedar, with brass hardware and highly polished, genuine veneer exteriors. This version features a bold, colorful finish, with Calabash panels bordered by lighter hardwood trim. My lock won't lock at all.Came bent and I can't seem to line it up to work.Nice box but lock is junk.